Factual error: In "Klub Katz" the captian yells "Iceburg, Iceburg, on the starboard side." But when you see the iceburg and the ship, the iceburg was about to hit the bow of the ship. Continuity mistake: When Courage gives the chicken his suitcase, it at first says "Mars" on it, but then it changes to "Albany". Trivia: The pig who runs the "Burgers Really Cheap" restaurant's name is Jean Bonne, and he says it's French. "Jean Bonne" is likely a deliberate alteration of "jambon". French for "Ham." Trivia: Throughout the show you see the word DIL and items with DIL written on them. This is because the show was created by John Dilworth. Trivia: When the computer is telling Courage about the giant kangaroo monster, the chicken it steps on looks just like the alien chicken from the very first episode of the show. It even has red eyes. Talking Fish: There's no such thing as perfect, you're beautiful as you are, Courage. With all of your imperfections, you can do anything you want to do. 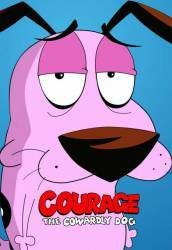 Courage: There's something fishy goin' on here, or my name is Stinky Looloo, and thank goodness it's not. Freaky Fred: Goodbye, dear aunt, I'll miss your farm. And Eustace's eboliant charm. And farewell, Courage, what's the harm? If I was slightly... naughty. With love, Fred. Question: Does any one know where I can get a MIDI, WAV, or MP3 of that drum beat that plays when Katz walks? Chosen answer: There don't seem to be many websites with sounds from the show but you may have better luck requesting it on one of the message boards or forums on the show. One site that may be worth trying is http://couragede.tripod.com/courindex.html that has a lot of multimedia, sounds and a message board of the show. Question: There is an episode where a travelling stage and it's owner get people to perform on the stage to an invisible audience (which cheers and applauds). The people then end up loving the stage and eventually get turned into puppets with strings coming out of the happy/sad faces at the top of the stage. Since most/all of the episodes of Courage are based on, or parodies of, famous tales, myths, stories and films, where is this one from? It sounds very familiar but I can't quite place it. Chosen answer: The episode you are referring to is the finale to Season 1, "The Great Fusilli. The episode description is nearly identical to your description. However, I have not been able to find any source of this being a parody. Perhaps this episode was just an original?